REAL 3D GLOOSY CARBON FIBER DIAL DASH COWL COVER FOR'16+ HONDA CIVIC FC SEDAN. 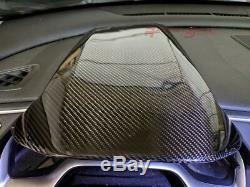 THIS ITEM IS REAL CARBON FIBER NOT PLASTIC OR DECAL STICKER.. (IF YOU DIDN'T KNOW WHICH MODEL CALLED CIVIC FC, PLEASE SEND ME YOUR CAR PICTURE). 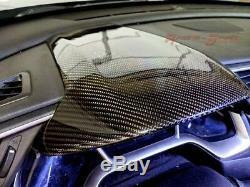 Up for sales is Real Carbon Fiber Dial Dash Cowl Cover for 16+ HONDA CIVIC FC SEDAN AND HONDA CIVIC FK HATCHBACK. Item made neatly by hand-laid layer by layer started from Fiber-glass, laid over with Carbon Fiber, then coated by High quality lacquer to make item shiny and looked always like the first date installed. YES this is HANDMADE version, so you rarely find elsewhere. We used only Premium Grade quality materials exactly the same as used on World class Super Car to make it looked nice to make you proud every time someone look at your beloved car... Yet we also coated item by UV protection, so it will not. Even if direct to Sunlight for long time. EASY TO INSTALL JUST FOLLOW THESE STEP. Clean up the panel by using ALCOHOL or DILUTED SHAMPOO and wipe out. In case of cold weather (under 20 degree Celsius), use the hair dryer to warm up the surface and glue before installing. Peel off and paste the cover over the surface, press all over the cover for a while to fit. Avoiding cleaning it for few days. WE DESIGN AND CREATE THE COVER ON GENUINE PARTS, SO PERFECT FIT GUARANTEED.. 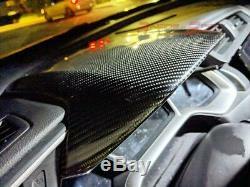 IT'S REAL CARBON FIBER ITEM.. NOT CARBON STICKER OR CARBON LOOK..
Today with high quality item in such a low price. Made from REAL CARBON FIBER. Not Carbon-look item or the cheap DECAL. ITEM IS BRAND NEW NEVER BEEN USED BEFORE. 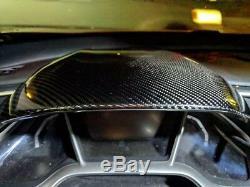 1 piece of REAL Carbon Fiber Dash Cowl Cover as shown and described above. Easy to fit even you have no skill. Fit for 16+ HONDA CIVIC FC SEDAN and CIVIC FK HATCHBACK only.. TRK# provided to see package status while in THAILAND ONLY..
My S&H quite reasonable because distance from Thailand to your country is around 5,000 miles, so S&H can not be negotiated. As stated on Ads, item is Custom Handmade, so the cutting would not as smooth as computerized cut, but we will always try hard to make it best as we could. 17th of every year will be Thailand New Year Festival called "Song Kran Water Festival". All order placed on Apr. Will be started production on Apr. And will be sent out soonest on Apr. Sorry for your inconvenience but this is our traditional holidays which I can do nothing. If you placed order after Dec. 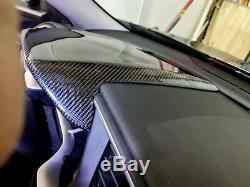 The item "3D GLOSSY REAL TWILL CARBON FIBER DASH COWL COVER FOR 16-19 CIVIC FC FK LHD ONLY" is in sale since Saturday, February 2, 2019. This item is in the category "eBay Motors\Parts & Accessories\Car & Truck Parts\Exterior\Mouldings & Trim". The seller is "starfish_99" and is located in default, Samutprakarn.